This is ultimately a story about how doing research for an online exhibition ended up sparking articles on Boing Boing, i09, and The Atlantic which explored a theme from the exhibit eight months before the exhibit would launch. 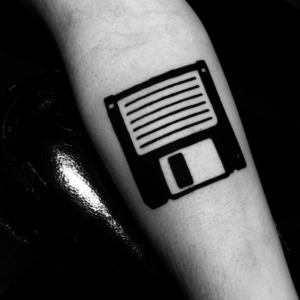 I think the story has some lessons for thinking about the future of digital collections and exhibitions. I spent 60% of my time at work in 2013 curating an online exhibition/collection/hypertext contextualizing the Carl Sagan papers in the history of astronomy and life on other worlds as evident in objects from across the Library of Congress collections. I’ve written before, about what I think that project has to say about how to compose such online things, but I haven’t shared much about how I went about identifying and selecting materials for it. 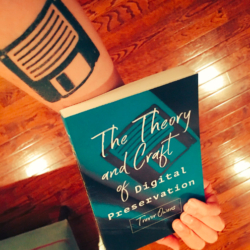 Through the process of working on the collection, I think I stumbled into something that has considerable potential to impact the way we should go about doing the work of creating such thematic narrative explorations of content in digital collections of libraries, archives and museums. A big part of the interesting story about the idea of life on other worlds is that, for a good while, it was completely reasonable, if not expected that there would be intelligent life on the other planets in our solar system. One great episode in this story is the history of the Martian canals. 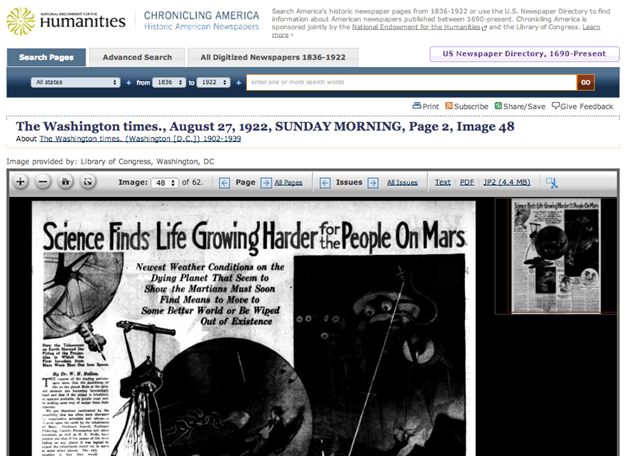 Knowing how big of a topic this would be for popular press I realized I could just turn to Chronicling America, the website for a partnership between the NEH, LC and a network of libraries and archives from around the country to provide access to millions of digitized newspapers. 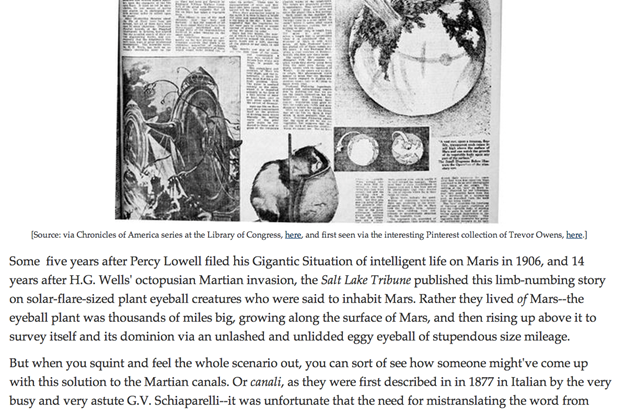 I knew there would be a good bit of material here, and I was thrilled to find that a search for “martians” in the millions of digitized newspaper pages from 1836 to 1922 turned up a trove of pieces to explore. So I noted the pieces in this search that were particularly relevant for the collection. Instead of keeping these in a document on what my institution lovingly calls a “workstation,” I went ahead and just used Pinterest to keep track of them. So I made Pinterest boards for each of the thematic sections of the collection I was working on. 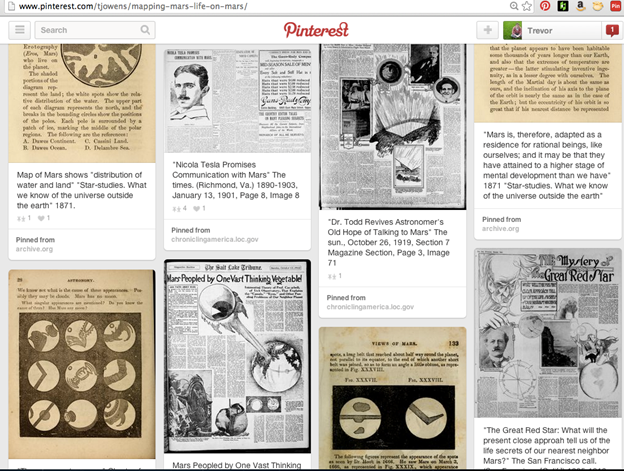 Below is an image of the Pinterest board I created on free and publicly available materials from across LC’s digital collections related to ideas of life on Mars. I liked using Pinterest for this as it created a visual way for me to track and organize these things. 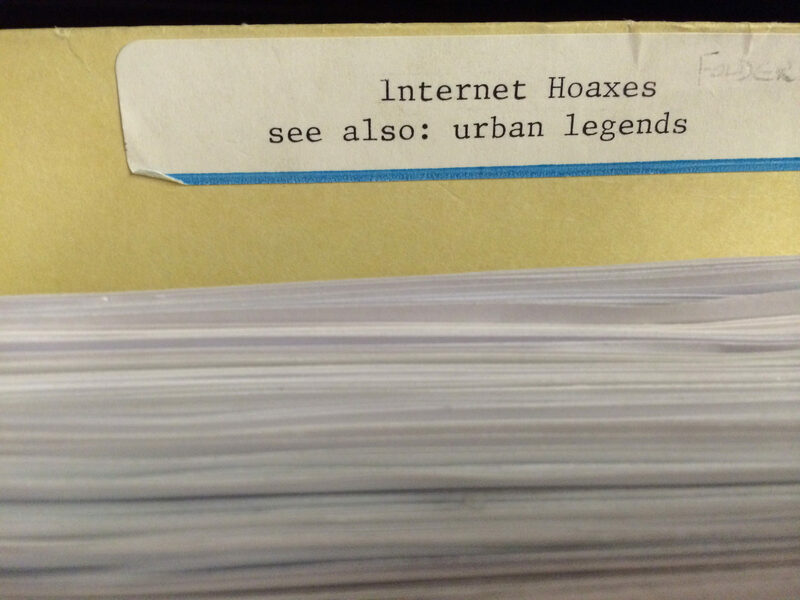 A big part of the project was to find what I could do with already publicly available digitized content, so it seemed like it would be fine to track these public materials using a personal Pinterest account. It had an interesting side benefit too. I started using Pinterest for this purpose because it was easy, but it being public had an interesting secondary effect. As you can see from the image below, the board I started on Mapping Mars & Life on Mars ended up with 191 followers. It’s not a part of any official anything, but it turned out that many of the historians of science and history of science curious who follow me on twitter were interested enough to review and share some of the raw material I was pulling together on Pinterest. I needed to do this kind of aggregation for my own work for the essays and online collection, so it made sense to keep that up and out there for others to benefit from. Which brings me to the vast thinking vegetable that lives on Mars. 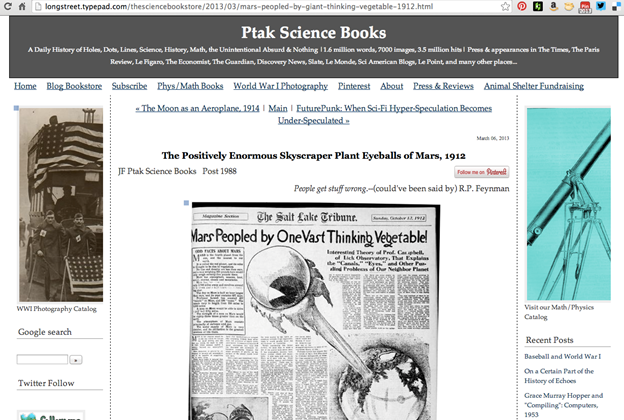 One of the newspaper pages I found ended up showing up in my feed reader on Ptak Science Books. If you don’t read John Ptak’s blog and you are into cool quirky history of science object stuff you are missing out. He is always sharing interesting finds. As you can see above, one day he found the article I found. It wasn’t just a coincidence, either. As you can see from the image below, John credited both the Chronicling America site and my Pinterest board in the post. That alone was a hoot. What a success. I set out to use Pinterest to keep track and organize materials I might work with, but in the process I found an audience interested in the topics on Pinterest and that rolled into John getting in there and not only sharing what I had found but digging in and interpreting and explicating what about that article was interesting. While I hadn’t provided any interpretive frame, the things that I found interesting about the article were the same that John focused on. But it didn’t stop there. It turned out that Alexis Madrigal also reads John’s blog and that he thought this was interesting enough to take it to an even larger audience. It also hit BoingBoing and io9. From my Pinterest board, to Ptak’s blog and from there to The Atlantic. 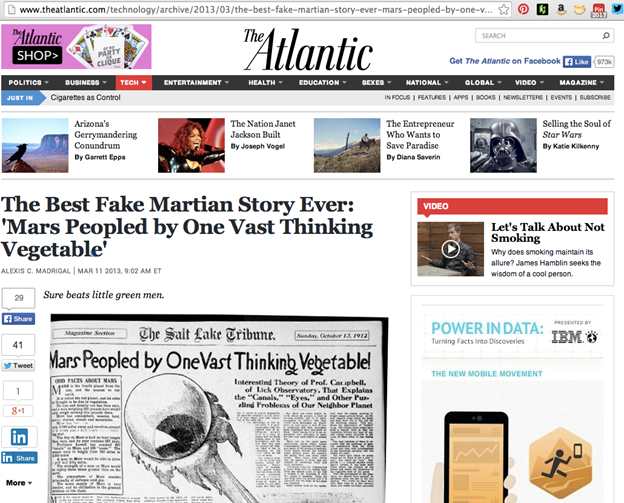 At this point, the Atlantic article ended up generating a surge of web traffic to the Chronicling America Website. So much so, that one of the project leaders noted the spike and went looking to see where it was coming from. The work I was doing to organize my notes, on at that point a project that had yet to be announced, had helped to punch a bunch of traffic and eyeballs back onto the content. That is, eight months before the launch the research process itself was hitting home a core objective of much of our work, spurring engagement and use of the collections. The traffic was nice, but importantly, it also had the effect of promoting thinking about the exact set of issues that the essays I was working on were focused on. Both Ptak’s blog post and Alexis Madrigal’s piece on The Atlantic are brief but substantive. They contextualize and explore the issues of what it was and wasn’t reasonable to think about the existence of life on mars in the early 20th century. To this end, before I had even gotten close to publishing my essays, simply sharing the way I was organizing my resources and tweeting about them had prompted public scholarship exploring the same issues in the same resources. So, before anyone had even formally announced this project, I was already meeting many of my objectives to spark conversations about the history of ideas of life on other worlds and generating significant use of the Library of Congress collections. I see a few different implications of this process. Defaulting to sharing serves the mission: The research that goes into preparing a thematic collection/exhibition is itself something that can be made into a public project that contributes to the objects of exhibiting materials. 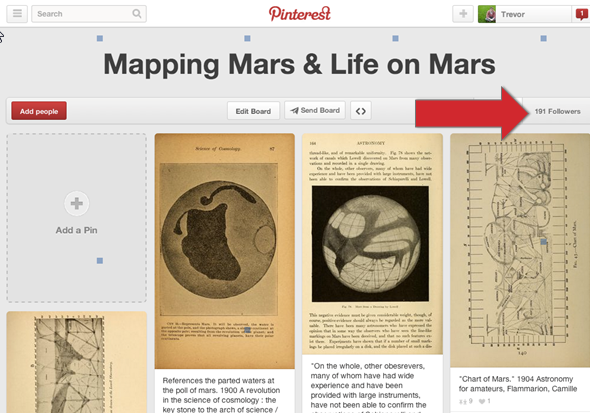 Using Pinterest to organize my research made that research into it’s own resource. While you can’t plan to have this kind of thing happen, you can plan to enable the possibility of it. 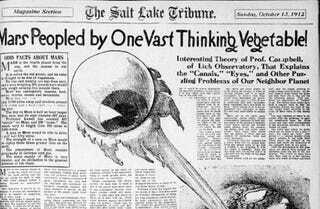 There is great stuff on the cutting room floor that can have a life of it’s own: It ended up that I didn’t even use that giant vegetable eye story for the exhibition. It wasn’t the right fit in the end. The Pinterest boards I made are loaded with items that didn’t make the final cut but they still found their own audiences. This is to say, If I hadn’t shared the process there is little reason to believe this story would have gotten much attention. Just think about all the objects that someone considered featuring. Just the fact that it was considered is likely an interesting link that someone might be interested in following. Sharing Objects in the Research Process Encouraged Deeper Use: In the thematic essays, I work out what the objects mean and people scroll through and read that. However, just sharing the items I was working with in progress ended up inviting others to take those materials and interpret and explicate them on their own. Intriguingly, less became more there. It helped encourage others to explicate and contextualize. Thoughtful piece that I plan to share with NHPRC grantees/applicants, some of which overlook the importance of performing outreach as they progress through a project. Thank you.